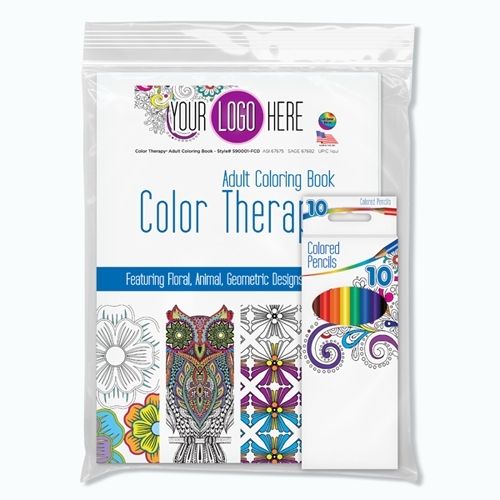 Color Therapy® 24 Page Adult Coloring Book. Featuring Floral, Animal, Geometric Designs and More! 24 unique designs printed on one side of a perforated white page -- perfect for framing. Full size (8" x 10.5") book with heavy duty, glossy cover. Perfect for banks, hospitals, senior centers, real estate, insurance, corporate events and more! Full Color Decal Printing on Coloring Book only – perfect for 1C up to 4C process logo printing. BONUS 10 Pack of Colored Pencils Included: Pre-Sharpened, 7” full length colored pencils in 10 assorted colors with premium leads. Packed into re-sealable polybag.